2013 has been a year full of natural beauty discovery for me. At the start of the year I probably only knew of about two or three natural brands! Now, around 9 months on from properly starting the switch to natural products, I can't even begin to count the number of wonderful brands I've come across! There are so many products I could include as a favourite for this year, but I've managed to narrow it down to 8 products that have really stood out to me. I'll be adding my thoughts on each product so bear with me if this post is a little longer than usual! 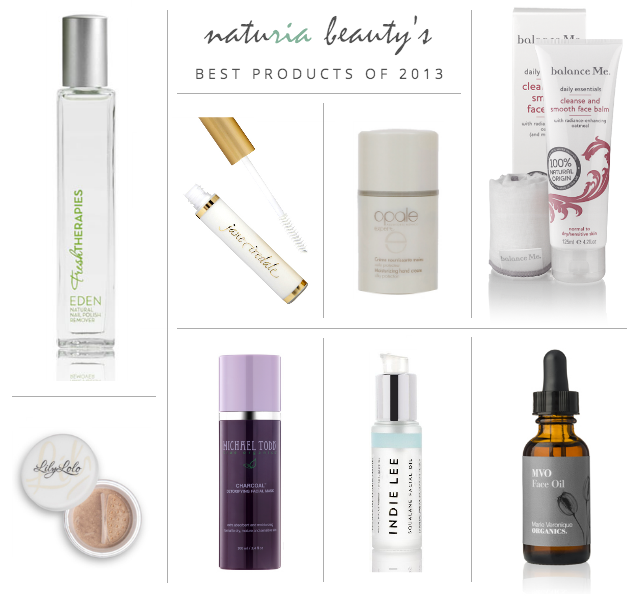 Without further ado, here's the selection I've chosen as my best natural beauty products of 2013! I discovered this nail polish remover back in the summer when I decided enough was enough with the drying effects and awful fumes of conventional nail polish removers. One of the main things to note about this product is that it actually has a pleasant scent! (Yes you heard me correctly)! This nail polish remover is even gentle enough for children and pregnant women as it's formulated without the harsh chemicals found in conventional remover. If you're looking for an alternative to the overwhelming smell of your usual remover, this is your answer! This product has made my transition to natural mascara a total walk in the park! I've raved about this eyelash primer on numerous occasions since I got it a few months ago - it really is a game changer! As the name suggests, this lash primer extends and conditions your eyelashes, making whatever mascara you use over the top so much more effective. This will be a staple in my makeup bag for a long time! My goodness, this is easily the best and most luxurious hand cream I've ever tried! Sure it's pricey for a hand cream and I might not have tried it if I hadn't kindly been sent this product by Opale, but it really is a high-end product with impressive results. I still can't get over how stylish the packaging is with it's super clever pump dispenser! If you're a fan of luxury products you honestly need to try this gorgeous citrus scented hand cream. I haven't written a full review of this product yet, but did mention it briefly in my "September Loves" post. I use this most days to remove my makeup as it really does perform wonderfully as a makeup remover with it being an oil-based balm. At first it took me a while to get used to the herbal scent, but now I don't mind it at all! This balm also contains tiny little pieces of oatmeal to gently exfoliate and encourage cell renewal whilst you cleanse. It's definitely a bathroom essential for me! I think this was the first natural makeup item I purchased, even before I properly decided to switch to natural products! I completely forgot about it and didn't use it for a large chunk of the year, but I've been using it almost every day throughout autumn and winter. The shade I use is "Barely Beige" which is the perfect match for my light skin. This mineral powder concealer provides a decent amount of natural-looking coverage and I love using this in combination with mineral foundation. I've mentioned this product a couple of times and it's definitely my favourite face mask at the moment. It's perfect for detoxifying as the charcoal draws out impurities, helping to unclog pores. I find it to be particularly effective at boosting moisture, rejuvenating dull skin and reducing blemishes - a must have in my beauty collection! Since Indie Lee's products arrived in the UK a couple of months ago, her products have been showered with praise. I was lucky enough to be sent a bottle of the Squalane Facial Oil just before it's launch in the UK at abeautifulworld and I was so impressed how a product with just one ingredient (olive derived squalane) could be so effective. This oil has numerous benefits for helping the skin keep a youthful appearance, such as diminishing age spots, promoting skin elasticity and boosting cell regeneration. I featured this oil in my recent review of the MVO Everyday Essentials line and I really wasn't joking when I said it works magic on my skin! I'm still not crazy about the scent, but the soft, smooth, blemish-free skin makes me keep using it again and again! My skin has been so much clearer since using this oil and I'll be devastated when my small bottle runs out as the full size is quite pricey, but for the wonderful results I do think it's worth it! Have you tried any of these products this year? What's your favourite natural product of 2013? Arrived home today to find my naturisimo package complete with the cleanse and Smooth balm. Can't wait to try, good to see people like it! Hoping it'll help soothe my eczema! The oils you mentioned sound good! Any that would be good for sensitive, combination skin? I've gone for the organic pharmacy skin rescue face oil to try at the moment. The primer sounds good too. I find it hard to find Gibson in my Indian skin tone range though. BalanceMe Radiance Oil is one of my favs as is May Lindstrom's The Problem Solver but the one product I keep raving about recently is Aurelia's Miracle Cleanser. Everyone needs this in their life!